The Buffalo Urban Development Corporation (BUDC), in partnership with Empire State Development, the New York Power Authority, and the City of Buffalo, is redeveloping multiple properties in the Northland Avenue Belt Line Corridor. 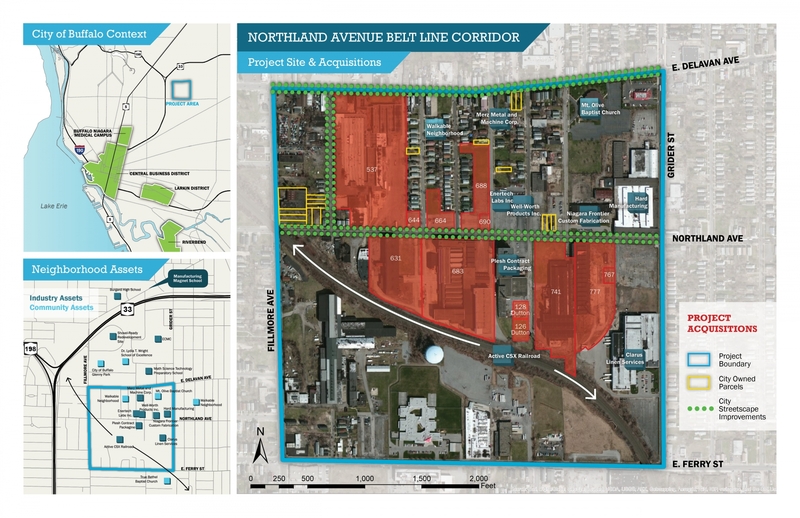 The Northland Corridor Redevelopment Project aims to return these properties to productive use, assist with revitalizing the surrounding neighborhood, and provide employment opportunities for nearby residents by creating a new manufacturing hub on Buffalo's East Side. Over the last decade, the city has focused industrial land reclamation efforts in South Buffalo, with remarkable success evidenced by the Buffalo High Tech Manufacturing Hub at RiverBend and Buffalo Lakeside Commerce Park. However, the city will soon face a shortage of shovel-ready light-industrial land for the projected growth in manufacturing. An accessible labor force, established road, rail, and utility infrastructure, and the potential for land assembly make the Northland Corridor an ideal location for the city's next manufacturing center. The Northland Corridor originally developed as a manufacturing center along the New York Central Belt Line, and is one of the most extensive industrial areas on Buffalo's East Side. It is located in a walkable neighborhood near the Erie County Medical Center, Mt. Olive Baptist Church, and several public schools, including the new Manufacturing School at Burgard. In September 2014, the Buffalo Billion Initiative awarded funding to acquire 50 acres of vacant or underutilized land and over 700,000 SF of industrial buildings in the Northland Corridor. Since then, BUDC and its partners have formulated a redevelopment plan for the key properties at the Northland site. Concurrently with preparation of this redevelopment strategy, the City of Buffalo's Office of Strategic Planning is preparing a neighborhood revitalization plan for the greater Delevan-Grider area.